But the real development of the modern bicycle began in the 1860s. Pierre and Ernest Michaux, father-and-son carriage makers, invented the 'velocipede', which had both handlebars and foot pedals. Its front wheel was larger than the one at the back; both, however, were made of wood. This meant that riding a velocipede was a very uncomfortable experience, and led to them being satirically described as "boneshakers". The key to making bicycles more comfortable was thought to reside in increasing the size of the front wheel. The penny-farthing bicycle was one result of this thinking. It had a frame made from metal, an enormous front wheel and rubber tyres, which gave a much smoother ride. It was, however, very unsteady and safety problems meant it went out of fashion very quickly. 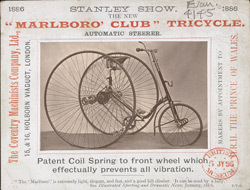 Bicycles also caused problems for women, in their corsets and long skirts, leading to the popularity of the tricycle. Conspicuous gentlemen, such as doctors and clergymen, also used tricycles because they were less dangerous and apparently more dignified.